There’s a popular chain restaurant that serves chicken lettuce wraps that I adore. Sure, I’m sure they’re full of soybean oil, high fructose corn syrup, and maybe MSG, but wow are they good! We don’t eat out all that often, and when we do I certainly don’t obsess over the details of the meal, especially when we are spending time with friends and just enjoying their company. This week I had a craving for those delicious chicken lettuce wraps, and thought I would give it another shot making them at home. I had made them at home before using another recipe, and they were just ok. This time, I made up my own recipe and was very pleased with the results. They got the approval of my six year old and semi-approval from my three year old. He took three bites of just the filling with no lettuce, so I won’t complain. He doesn’t really eat anything these days. Maddening! 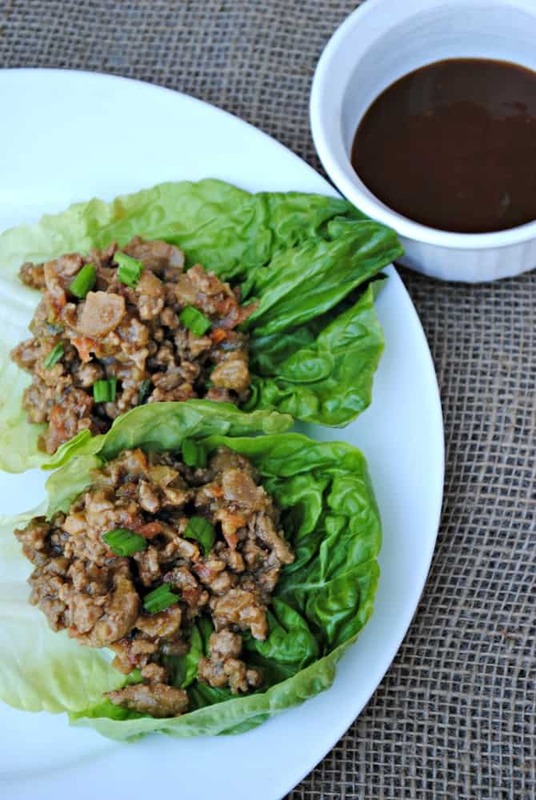 Chicken lettuce wraps are usually made with hoisin sauce, which is delicious, but full of additives and ingredients that I try to avoid. I did buy a bottle of organic hoisin sauce so I could bring it home and mimic the flavors in it. Traditional hoisin sauce contains miso, which is something that I don’t normally keep in my kitchen. Not that it’s a “bad” ingredient or anything, I just don’t cook with it often. I wanted to keep all of the ingredients things that most people would have in their homes. 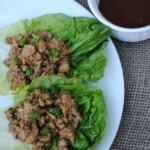 Now make these “clean” chicken lettuce wraps soon! It’s a fast and flavorful weeknight meal that comes together in under 20 minutes. Simple chicken lettuce wraps with clean ingredients that you can feel good about. Add ground chicken, carrots, green onions, water chestnuts, and garlic and stir fry together, breaking up chicken, until chicken is no longer pink. Mix together remaining ingredients in a bowl or measuring cup. Pour about half of the sauce over the chicken mixture and bring to a low boil to slightly thicken sauce and have it incorporate with the chicken. Taste and add more sauce to your liking. Fill lettuce cups with chicken mixture and serve immediately. The extra sauce can be used as a condiment to serve with the wraps if more sauce is needed. If you can find a clean organic Hoisin sauce, feel free to also use that as a condiment.